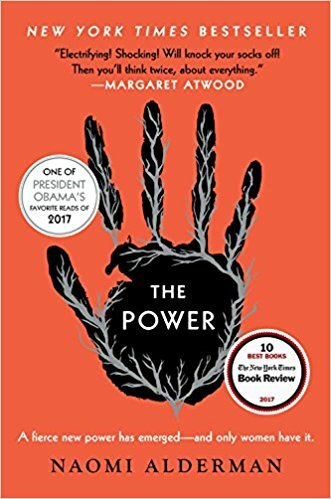 The Power considers a world in which women can create and conduct electricity with their bodies, with enough juice to kill a man. Now the tables have turned, and it’s men who have to be afraid. What will become of this new world order? The story unfolds through four main characters. There’s Roxy, daughter of a London gangster; Allie, grown up in foster care and creates a new persona once her power comes in, that of Mother Eve; Margot, mayor of somewhere in the US (if it tells me where I already forgot); and Tunde, a Nigerian journalist. This is a hard one for me to review. I’d seen so much praise beforehand and was expecting to be blown away by it, and in the end I’m left frustrated and puzzled and without much enjoyment. It is such an interesting premise yet the story told does not live up to that. It’s a little on the nose for me; this is how women feel threatened by men being stronger, so men will feel the same way. The situations will be exactly the same just with genders reversed. There’s no nuance. Surely it would be far more complicated than that? So I don’t know what it is or what it’s trying to be. I’ve read it’s satire, but it doesn’t fully come across that way to me. Is it trying to hold up a mirror to men to gain their sympathy/shock at how it is for women? Is it merely suggesting that power corrupts everyone and we’d all do the same given the opportunity? Because if it’s the latter I don’t buy it. And maybe I am naive or more hopeful than I should be, but I can’t imagine a world where women would go through what we have and see what we see and then just do the same when we have the upper hand. That there would be an utter loss of compassion. Some women, sure, but not all. Maybe I think too much of women that we would seek to build a better world, not recreate what has gone before. I think it wants to be a Handmaid’s Tale – as evidenced by the letters that bookend it and the archaeological ‘finds’, but it misses the mark immensely for me. It never felt chillingly real or possible like Handmaid does. All of that aside, is it a good story, well told? Not particularly. The structure lets it down, in that we follow the characters sporadically over a period of years as the world adjusts to the new power shift, but we never get to fully immerse ourselves in any of them. I only really felt invested in Roxy, the others you have to get through. Margot, for instance, left me cold. She’s a politician, an ambitious one, and seems fairly typical. Why her story? It felt like she could have been anyone. There are also times when it ‘head hops’, it’ll be in Roxy’s section, for example, but then have Tunde’s point of view. Or Margot’s section but have her daughter Jocelyn’s POV. If you’re going to jump around why bother titling sections? There’s also a lot of graphic violence depicted which wasn’t pleasant to read. Overall I was definitely expecting more from this, but it’s not a page turner and plays it far too safe with an otherwise excellent premise. Share the post "They do it because they can"
Sometimes I wish people with intriguing ideas would pitch their premises to great authors and let them run with it. Yeah, I bet Atwood would have taken it in a completely different and unexpected direction. Thank you for this review! Book was just recommended by a friend, I don’t think she’s far through it yet and was going on concept. Sorry to hear the execution isn’t quite there, though. I know it’s had rave reviews elsewhere and a friend of mine couldn’t say enough good things about it, so it may still be up your street.